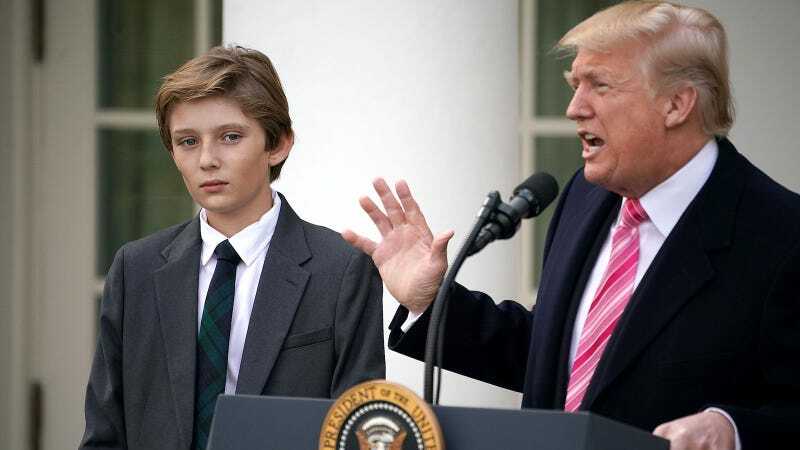 The Associate Press reports that St. Andrew’s Episcopal School, where 11-year-old Barron Trump is a student, joined over 100 other schools in the D.C/Maryland area in an effort to pressure his father into supporting actual gun control measures. The letter, signed by the school and originally published in the Baltimore Sun, calls for stronger background checks and criticizes the Trump administration’s suggestion—already a reality in some states—that teachers carry guns. We need a robust system of registration and background checks, with a particular eye toward weapons capable of rapidly firing a vast number of deadly shots. We need stronger mental health services and more effective communication among agencies responsible for the well-being of children, adults, and families. What we do not need is to arm our teachers with guns, which is dangerous and antithetical to our profession as educators. Just another uncomfortable day in the presumably very uncomfortable life of Barron Trump.